Scroll past the map for a numbered trail guide or click HERE for a PDF version. On this trail, you will find 14 posts painted red on top that correspond to the numbered descriptions below. 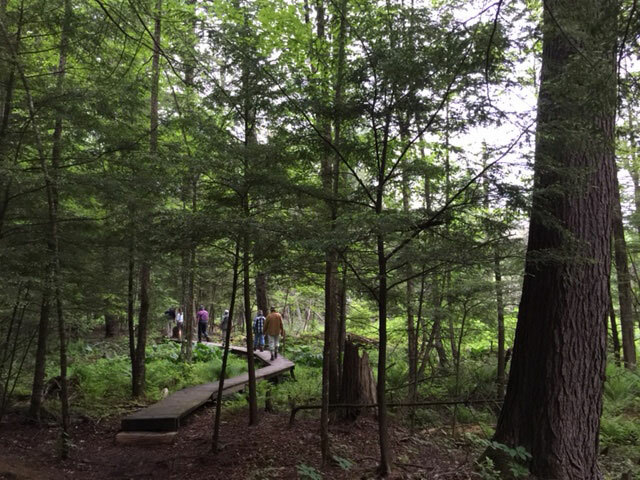 This 1/2 loop trail begins and ends right outside the Nature Museum in the Main Area of our property. While relatively flat, the trail does include boardwalks, heavily rooted areas, and a slight incline at the end. It can be completed in 45 minutes -1 hour. 1) The “back half” of this trail follows Whitehall Rd. Please be aware of vehicles using the road. 2) Some sections of this trail may be impassable during/after periods of heavy rainfall. 3) Bug spray is recommended during warmer months. 4) As with any outdoor excursion, please do a “tick check” on your body after hiking this trail. 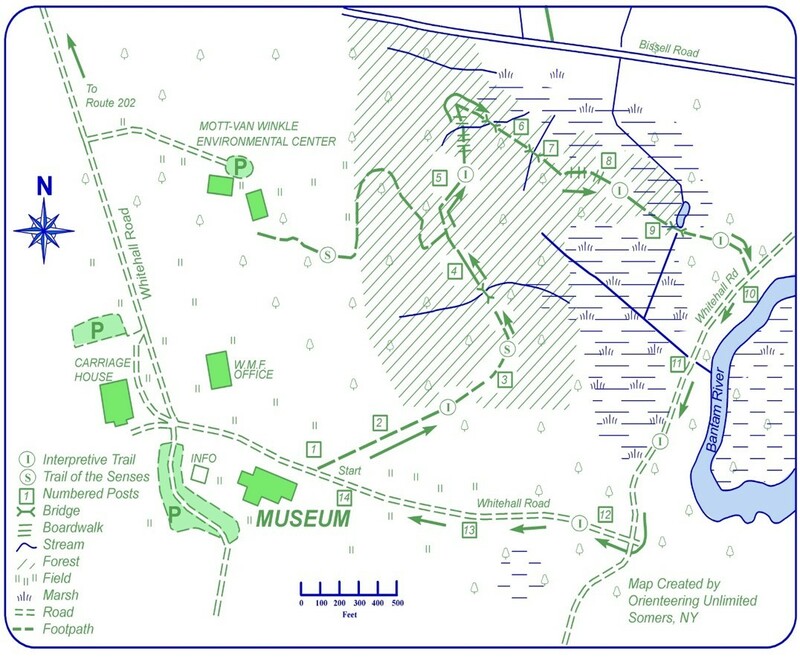 Trail THEME: White Memorial’s cultural and natural history are written in the landscape. In the late 1800s and early 1900s, brother and sister Alain and May White spent their summers in the large yellow house behind you, which is now a Nature Museum. 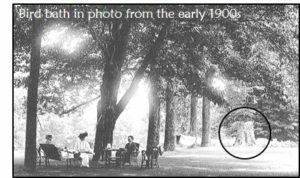 They would often entertain their guests under the shade of large maples and ashes that stood in their front yard. It is here that they built this concrete bird bath shaped like a tree trunk. 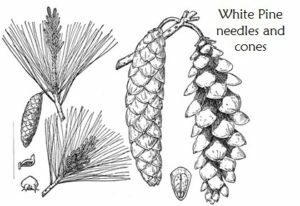 The Whites championed conservation and turned their 20-acre private property into what is now a 4,000-acre nature sanctuary. Watch your step! Poison ivy grows off the path here. It can grow as groundcover, a shrub, or as a hairy vine. All parts of the plant contain an oil called urishiol, which can cause an itchy rash. Each leaf has three leaflets, hence the phrase, “Leaves of three, leave them be.” The leaves can sometimes look shiny or reddish and have toothed edges, but not always! 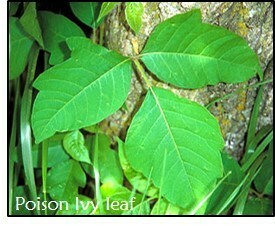 Avoid touching any unknown plant with “leaves of three” or hairy vines. On your way through the woods, look for hairy vines in all seasons (but don’t touch!). Ferns are a fixture of CT’s woodlands. The ferns before you are called evergreen wood ferns; they are unique in that they stay green all year. Most other ferns “die back” each winter, but emerge again the next year. In spring, look for fiddleheads, which are the curled up leaves of young ferns. 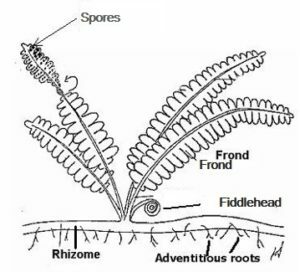 By summer, a fern’s leaves, called fronds, form a fan shape. Brown spores, which are like seeds, also appear. The spores on this evergreen wood fern are found on the underside of its fronds. See any now? 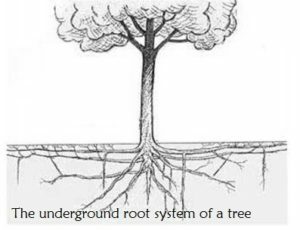 The large “root ball” you see here once existed underground, taking in water and nutrients for the attached hemlock tree. A wind storm blew the tree over and pulled the root system out of the ground. The tree and roots are no longer living. Just to the left of the root ball you will see several other dead trees that were struck by lightning in another storm many years ago. Storms can greatly affect a forest landscape. Stop #5) How Did This Get Here? This large boulder was brought here and left by a glacier about 20,000 years ago. 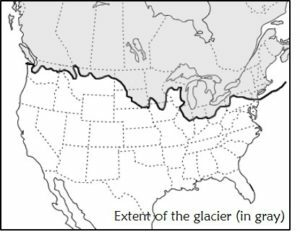 During a period known as the “Ice Age,” a giant glacier covered the entire upper half of North America. Imagine a block of ice that weighed 320,000 pounds per square foot, spanned 3,000 miles, and towered at least 1 mile high. As that glacier moved, drastic changes were made to the land underneath, such as the rearrangement of huge rocks. Isolated boulders liked this one are called glacial erratics. Spoiler alert: you are about to read below how old this giant hemlock tree was when it died. Want to find out for yourself first? Look closely at the cross-section of the tree lying on its side next to the trail. Count the dark rings from the center to the outer edge. 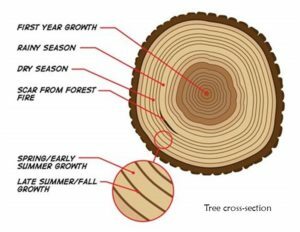 A tree acquires one light ring (spring growth) and one dark ring (summer growth) every year. This tree was about one hundred and ninety-five years old when it fell after a storm. The Whites built several roads through their property. 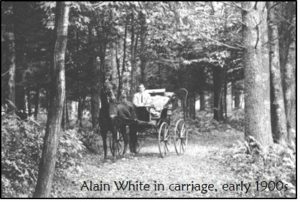 They would often drive their horse-drawn carriages on them to access interesting natural areas. The trail you are now on used to be one of those roads! Look under the bridge you just crossed; you can still see the stone structures that supported the original carriage bridge. You can imagine the whole trail must have been much wider and smoother at that time to accommodate large carriages. 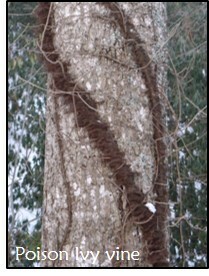 What shape do you see on the tree trunk before you? That’s right, a heart. Return the love and wrap your arms around this giant white pine tree (Pinus strobus). The pine trees in this old growth forest remnant are over 200 years old! They are some of the oldest trees on White Memorial’s property. Incidentally, the heart-shaped swelling you see was formed when the tree’s cells started dividing rapidly in response to a virus, fungus, bacterium, or insect infestation. What’s a beaver’s favorite month? Sep-TIMBER! A beaver almost sent this tree crashing down, but stopped short of felling it. 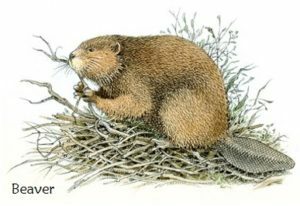 Not only do beavers use trees to build dams and lodges, they also eat a nutritious inner layer of the tree trunk known as the cambium. Many trees on this trail have the marks of hungry beavers. In fact, this entire landscape has been modified by beavers, or “nature’s engineers,” from the opening of the canopy to the encroachment of the marsh. 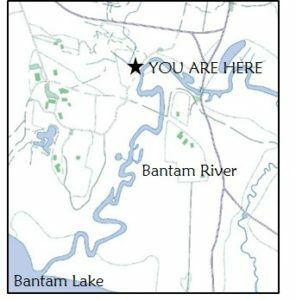 You’ve made it to one of the most prominent features on White Memorial’s property, the Bantam River. Just to the south of you, this river opens up to Bantam Lake, the largest natural lake in CT. 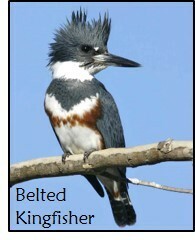 The eroded banks along the river make a great nesting site for belted kingfishers, while the vegetation may conceal great blue herons, wood ducks, and even muskrats. Look closely for life on and in the river! With a forest out ahead of you and a river behind you, what do you call this in-between area? It’s a wetland! This area is almost always waterlogged, but the depth varies by season. Wetlands are important for purifying and storing water, reducing flooding, and providing habitat for wildlife. 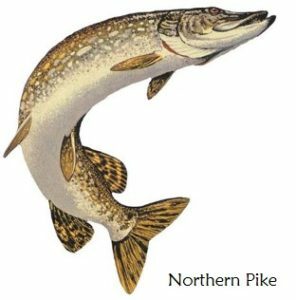 Occasionally, CT Department of Energy and Environmental Protection uses this wetland as a breeding ground for Northern Pike (a.k.a. “water wolves”). These important predators are later released in Bantam Lake. Yes, this is a magnificent, old-growth white pine tree. But, it also holds a secret! About 20 feet above you in the left trunk, a wild honeybee colony often inhabits this tree. This colony is likely an offshoot of the observation hive on exhibit in the White Memorial Nature Museum up the road. 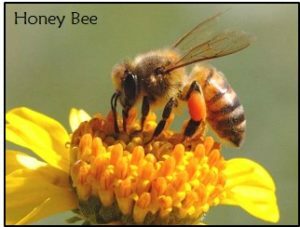 On warm days, look up to possibly see worker bees fly in and out of the small holes in the trunk. You may also see surplus honey and waste products seeping out. Look closely at this rock to see its shiny flecks. Many of northwestern CT’s rocks, like this one, contain a mineral called mica that literally glitters. As early as 30,000 years ago, people were using mica to add shimmer to their cave paintings! 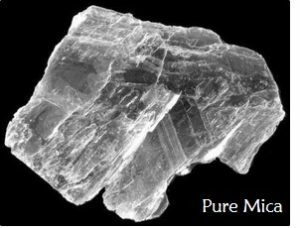 During WWII, mica was used in several electronic devices because it is heat and flame resistant. Today, mica mainly functions to insulate wires on household appliances, and to add shimmer to makeup and paint. Plunging 365 feet below the ground you’re standing on lies a geothermal pump system. Geothermal means “heat from the Earth.” By using the relatively constant temperature underground (around 55°F), we can help heat the Museum in the winter and cool it in the summer. 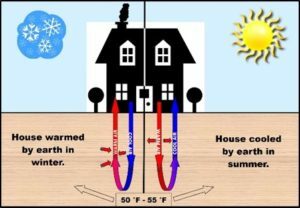 Since geothermal heat is a renewable source of energy, it won’t run out! This system, along with the solar panels and wind turbine we have installed, show how we can reduce our “footprint” on Earth. We hope you enjoyed White Memorial’s Self-Guided Interpretive Trail. As you can see, White Memorial’s cultural and natural history are written in the landscape. We hope this interpretive trail will inspire you to “read” and appreciate the natural landscapes all around you. Northwestern CT is a unique and magnificent place with a diversity of wildlife. 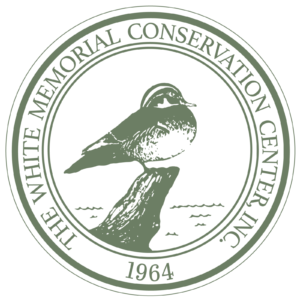 If you would like to support The White Memorial Foundation and Conservation Center, please make a donation or become a member! Beaver, front cover – Leo Kulinski, Jr.